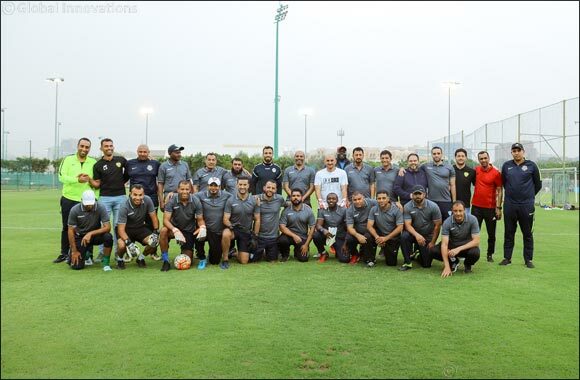 The goalkeepers’ workshop was supervised by Zakariya Ahmed, Lecturer in UAE Football Association and Asian Football Confederation, Naser Khamis, Coach of UAE National Team Goalkeepers and former lecturer in the UAE Football Association, and Khamis Salim, Goalkeepers’ Supervisor in Al Nasr Sports Club. The goalkeepers workshop dealt with attack building, goalkeeper support, using foot to pass ball and strategies to be followed by goalkeeper in case of direct confrontation vs. other team’s striker. This Forum is organised annually as part of Dubai Sports Council’s program to boost technical level of juniors and youth, and to enhance the competence of coaches who work in academies and football companies of Dubai. It is also arranged in the same context of other football coaches’ courses; parts of which are external training courses for assistant coaches in Dubai football companies, held in collaboration with the Football Associations of France, Germany, Italy, Portugal and Spain. Several other specialised training courses were also arranged in this respect.